The Modi government has handled inflation far better than any government in the past two decades. Both the stock market and currency indices have begun to show confidence in the economy, despite the mounting global headwinds of trade. The assessment of Narendra Modi’s five- year term has got entangled with the “cooling off in major economies” as rating agency S&P puts it, that has happened in the final year of this government. The Modi government has scored an average 7.5 per cent growth of GDP annually during its term (see chart). Even though there are controversies about the exact numbers, most economists are agreed that the trend is upwards. This point was taken up by some of the economists the NITI Aayog invited for a meeting in New Delhi recently who said they wanted the government to do more to make the economy grow at its full potential. The meeting was meant to chalk out a growth strategy for the new government that will take over in June. “The economic score card is quite good, except for lagging reforms in the public sector,” said Sumit Bose, vice chairman, National Institute of Public Finance and Policy (NIPFP). Bose ticks off overall GDP growth, maintaining soft prices, and the increased use of Aadhaar for delivery of cash support as some of the positives for this government. This is also the verdict of the markets. Both the stock market and currency indices have begun to show confidence in the economy, despite the mounting global headwinds of trade and the running out of QE-led expansion in the US economy. Aditya Birla Capital noted in its report on Indian markets that the Nifty was ‘charting an adventure without fear of drowning this time’. The S&P Economic Snapshot of Asia-Pacific is also confident that while ‘(economic) activity in India remains uneven, policies should lift growth a touch over coming quarters’. The pluses for the government are the management of inflation and government finance. As former RBI Governor Raghuram Rajan has often pointed out, inflation robs the earnings of the poor and just about anyone with a fixed income. The Modi government has handled inflation far better than any government in the past two decades. The Vajpayee government had a similar record but it scored when the global, especially the Asian economies, were in the doldrums. 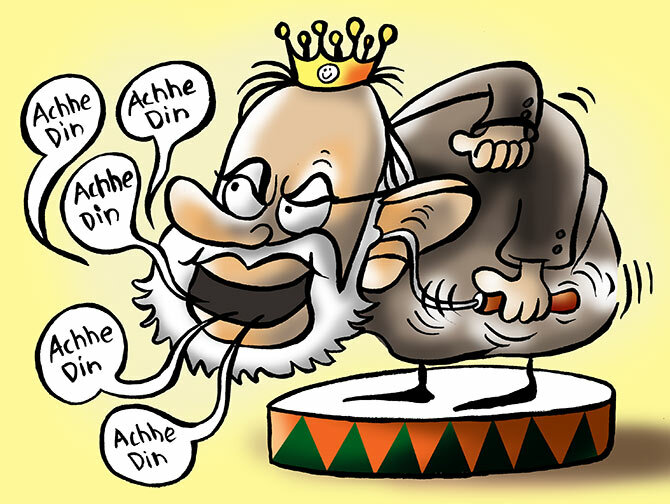 The sustained rise in inflation was one of the chief reasons for discontent in the two terms of the Manmohan Singh government. The Modi government’s inflation numbers are one reason why it has not faced anything more than sporadic protests on the streets. Had they been bad, they could have conjoined with other issues to make life difficult for the government. The softness of prices has been most visible in manufactured items and food. Of course, this has led to severe problems for the agricultural sector as farmers have battled weak price recovery and consequent low income in the process. The soft prices have helped the NDA keep its housekeeping neat. The government has got away without having to offer any significant tax cut or cut in non-productive expenditure like subsidies, except oil. Previous governments have continuously wrestled with this conundrum, keeping the fiscal deficit numbers up. 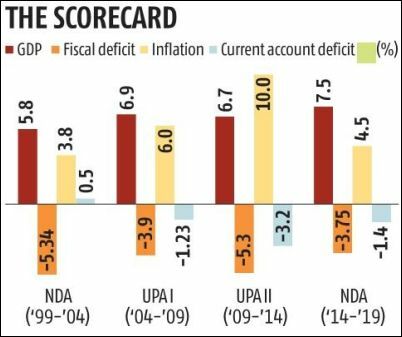 As the table shows, Finance Minister Arun Jaitley has come closest to the fiscal deficit targets, something that no other government has managed to rival despite expanded income support and other programmes. But the cost has been capital spend. One of the critical investment plans of this government has been the reform of the state electricity distribution companies through the Ujjwal Discom Assurance Yojana scheme to turn them around financially. It has shown little progress. Government data shows that within five months of 2019-20, their dues to generating companies rose by 60 per cent to Rs 26,500 crore. Telecom investment was another area where the returns could have been very high. “Our reports show that investment in this sector has a disproportionate (beneficial) impact on state level GDP,” said Rajat Kathuria, director, ICRIER. Bose agrees. “Last year’s performance of the economy has been marred by handouts like income support and debt waivers and the consequent need to force public sector units to financially support the government fisc,” said Bose. The NDA government has compensated by pulling up the gross tax to GDP ratio to close to 12 per cent. The fiscal policy statement estimates the number to touch 12.2 per cent by 2021-22. The numbers had slipped to 10 per cent a decade ago (2009-10). “A caveat here”, said N R Bhanumurthy, professor at NIPFP, “is that the GDP numbers themselves have come under scrutiny. A better metric to assess the government’s performance is the introduction of the goods and services tax that has now settled down with simpler and wider coverage. As the movements in the rupee and the stock markets show, the economy has built up steam in the last five years. The expectation is that it will speed up now.